So we’ve got the backhaul costs pretty much nailed down: pretty much everything we need in order to get a a little spot of laser light to the start of the glen. The remaining logistical problem is that we’re going around in small circles with contractors for the dig in the glen: they either don’t want the work and over-quote or they don’t understand the dynamic of community engagement and the cost again rises. …unfortunately, it transpires that The Scottish Government has chosen (and it may have been Hobson’s choice, given that telecoms strategy is not actually devolved to Holyrood) to use the GBER accreditation of the overall UK broadband delivery project, BDUK, to access that approval route. However, in the grand tradition of there being no Good Idea that the British can’t turn into a Very Bad One, we have been informed that BDUK has failed to maintain its GBER status. So, until such time as that is sorted out, we appear to be stuck with either wishful thinking or a full EU procurement, which would lose us another year on our project. We’re told that this is ‘imminent’ but it is currently unclear whether that’s to a real-world definition of ’imminent’ or that of the Civil Service. We have a weather-limited build season here and we’re already getting into it, so there is currently much twitching of appendages. What we are hoping for is some test trenches to be dug in the very near future, to test the viability of a new micro-trenching technology. When that happens, there will be pictures of whirring things and (no doubt) flying clods of scenery. The joy of anticipation, eh? However work continues apace on getting everything lined up in terms of funding, skills, schedule and contract. We’re talking at the UKNOF (UK Network Operators’ Forum) meeting in Manchester on 21 April and will be attending a Show’n’Tell day being organised by the ever-helpful trailblazers of community fibre, Broadband For the Rural North (B4RN) on 26th April. 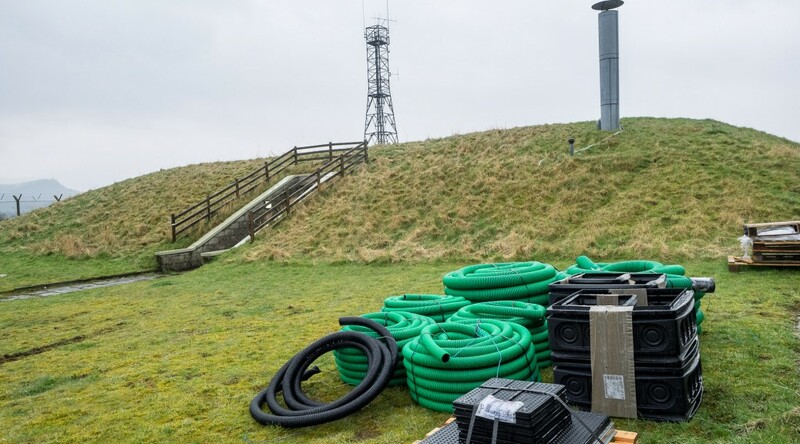 Incidentally, the header picture shows the piles of conduit and ducting that are about to be used to provide the adjacent old army camp, now owned by the Comrie Development Trust, with fibre broadband. We also jumped through all the hoops that were put in front of us for funding, but we never got any, because if we had, we would have had to build it their way, and their way is as flawed as the funding. We’d looked at doing just what you’d done – our issue though is exactly what you surmise – too sparse: we’re <200 properties in a fairly discrete area and are surrounded by areas that are in scope for the DSSB rollout, so we’re not allowed to build our business case for public funding on serving those areas. So much more difficult (but perhaps not entirely impossible) to get to critical mass, even for our backhaul.